One of my favorite aspects of exploring new places is the exotic cuisine I get to experience. While each place I visit has mouthwatering delicacies, my favorite dishes belong to India. India’s culinary scene infuses everyday staples with aromatic spices and colorful sauces. Unique flavor combinations burst on your tongue, and in some cases singe your taste buds. The spice combinations are so different from typical Western entrees, and it always keep me coming back for more. India’s cuisine can be divided primarily into northern and southern classifications, and can be further subdivided into regional fare. 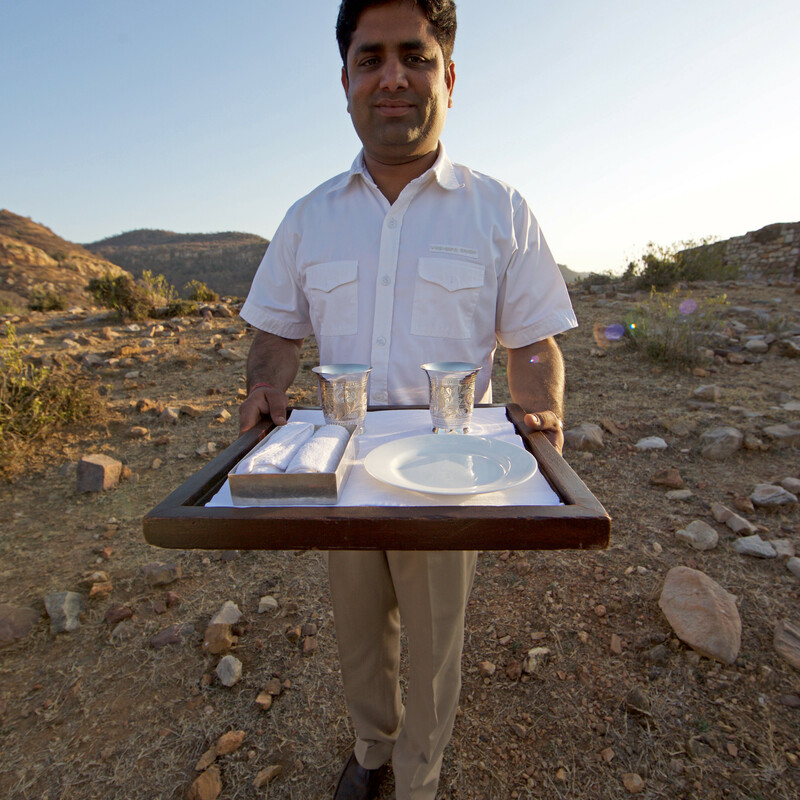 So let’s get started and sample some of the best dishes in India! If you are a vegetarian like me, you’re in luck! India has numerous options for a meat-free diet. However, even carnivores agree that some of the best dishes in India are the vegetarian ones. Take Dum Aloo for example. Dum Aloo is a potato based dish simmered in a creamy curry sauce. Typically served as a side dish, it is also hearty enough to grace your table as an entree. The savory gravy combines cashews, yogurt and a myriad of spices producing a reddish orange saffron sauce. You can soak up this mouthwatering leftover sauce with rice or Naan bread. When I need a starchy fix, Stuffed Paratha is my go-to dish in India. Paratha is a type of bread associated with the northern region of India. It’s a typical breakfast food, and each household seems to concoct their own stuffing unique to their tastes. Spiced potatoes, onions, veggies and cheeses are just a few of the ingredients commonly found inside the butter soaked walls of the Paratha. Careful! This is a heavy dish, and you might need a nap after consuming a Stuffed Paratha or two. Do not be alarmed by the strange texture and color of Palak Paneer. Palak Paneer will arrive at your table appearing like a steaming green soup with floating cubes of white. Odd? Yes. Delicious? Absolutely! Another vegetarian option, Palak Paneer is created from pureed spinach seasoned with garlic and garam masala. A soft, cubed cheese gives the dish texture and adds a savory culinary dimension. Palak Paneer goes well with rice and is full of vitamin A.
I realize you may not stick to a meatless diet, or be an adventurous eater. Don’t worry. 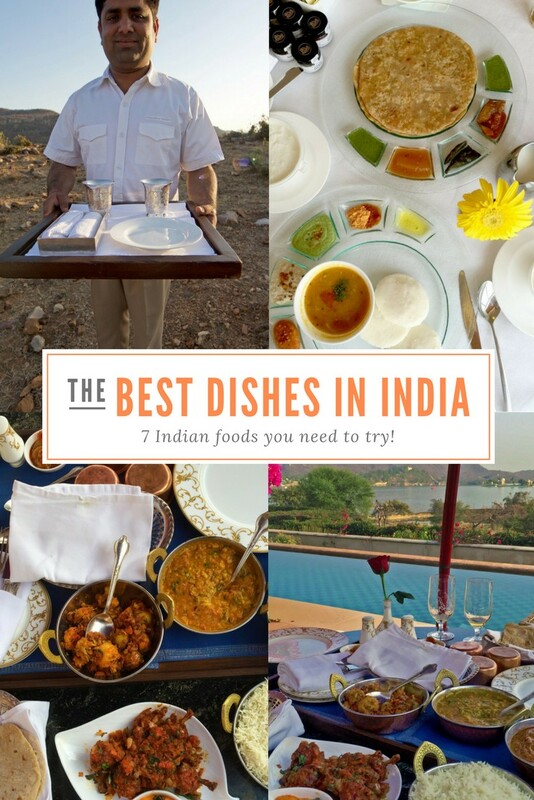 Some of the best dishes in India will appeal to my carnivorous, picky eaters as well. Stick to butter chicken. Since I’m a vegetarian, I’ve never had the Butter Chicken, but my husband raves about it! He describes it as simple, savory and succulent. In other words, you’ll love it! Butter Chicken is probably the most popular northern Indian dish. When you’re in India it will be difficult to miss! The chicken is seasoned in a myriad of spices and yoghurt, then doused in a creamy red gravy comprised of onions, tomatoes, and ginger. Finally, the sauce is infused with garam masala, turmeric, cinnamon and cumin. The result is culinary perfection. Of course, Butter Chicken is served with rice, and I’d recommend a side of Naan bread to dip in the leftover sauce. Samosas are not exclusive to India. The yummy treat can be found in several areas of the middle east and Africa. However, the Punjabi Samosa never fails to put a smile on my face, and is still one of the best dishes in India. This fried delight resembles a triangular dumpling or pastry. It is filled with a savory combination of peas, potatoes, chilies and cashews. Punjabi Samosas tend to be vegetarian and are generally served with a side of mint chutney. If you need a bit more protein you may want to pair it with the Butter Chicken! Definitely worthy to be on the list of the best dishes in India, Thali is actually a serving style as opposed to a particular dish. Thalis are considered well-balanced and healthy options. Consequently, you are treated to a variety of Indian staples when you order Thali. Served on a circular tray, a mound of rice is paired with one curry (you usually have your choice of vegetable, chicken or lamb), and is surrounded by small bowls of sides, sauces, chutneys, and curd. Caution–these dips can be scorchingly hot – my favorite! You pour small portions of the sauces and chutneys over the rice as you eat. Start with the spiciest and work your way to the yoghurt sauces to cool off! 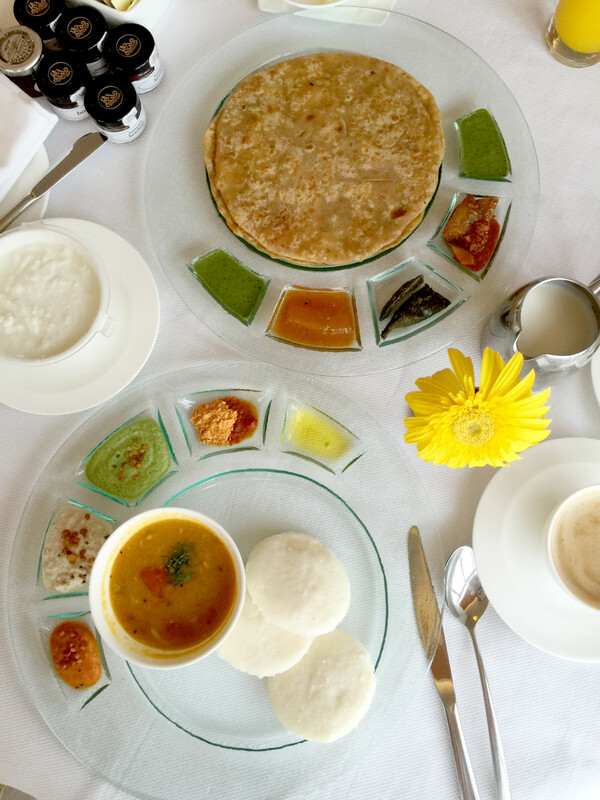 Typically, Thali also comes with Roti bread to soak up the remaining sauce and an occasional sweet treat to finish. 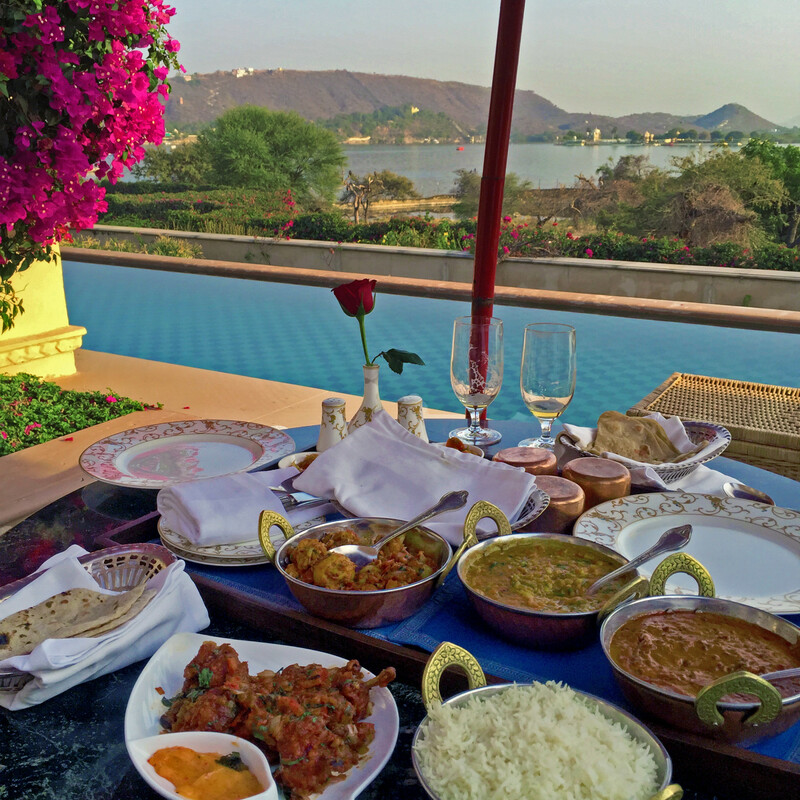 My stay at the oberoi udaivilas consisted of an endless Thali plate. It is safe to say I was in Indian food paradise! 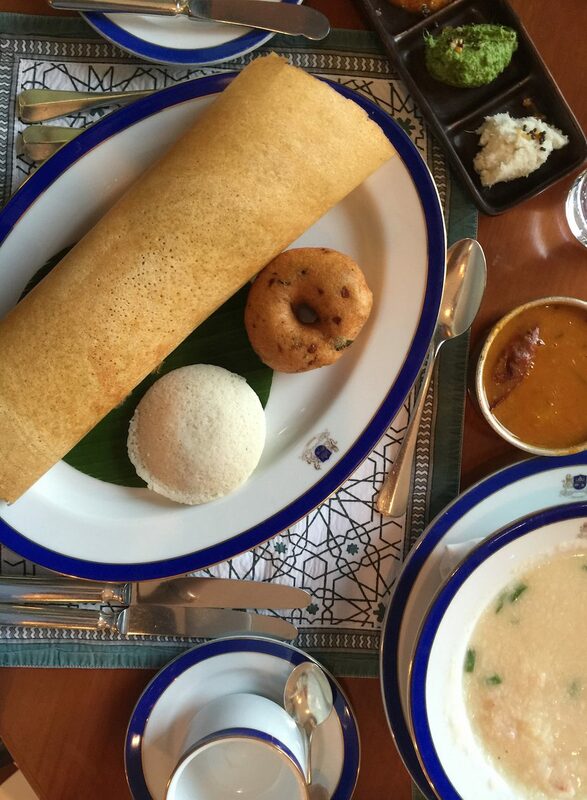 A south Indian dish, Masala Dosa takes some unique craftsmanship! The juxtaposition of the crunchy shell and soft filling makes my mouth water. Although preparation varies across Indian cities, Masala Dosa means the Dosa crust will be stuffed. The shell is perfectly crisp, almost like a savory wafer. Then it’s filled with savory stuffing. Ingredients can vary slightly, but you can usually count on a mixture of potato, coconut and coriander.The dish also comes with an array of chutneys or Sambar (a lentil-based stew). Nervous? Don’t be! The flavor is wonderful! Indian food remains one of my favorite culinary genres. Just the thought of these exotic culinary creations has me in the mood for a meal! Have you tried any of these dishes? If so, I’d love to hear from you. Which is your favorite? Are you traveling to India? Check out 9 things you didn’t know you could do in North India! I agree Indian cuisine is very flavorful and offers so many choices, but samosas are among my favorite Indian dishes.